The past week has been awful. I was paralyzed with fear about my life as an artist. I went into a dark hole and didn’t know if I would ever get out. When I posted about getting rid of toxic people I really meant it. I was taking in their negativity like a sponge. I realized that my life and my art have to come first. Chasing after people because of loneliness is destructive. I have to remember that I can’t waste time on people and things that distract me from my mission. I don’t have time to waste. I’m so grateful I was able to see what was happening and pull myself back from insanity. I need to use my talent and keep moving forward. I have gotten so many signs that I can do this and it is not unrealistic. DOUBT CAN DESTROY AN ARTIST. DOUBT IS THE DINOSAUR IN MY MIND. FAITH AND BELIEF MAKES ME CONFIDENT. ALSO HOPE. So I was depressed when the curator of the Riverdale Gallery came and returned my paintings from this months show. And then she said a man is interested in one of my paintings. I was uplifted and pulled back from my reptilian brain. And it was priced at $1200. The curator said I overpriced my paintings and they would not sell. I don’t care that is what I do. I don’t undervalue my work today. And as I get better prices will go higher. 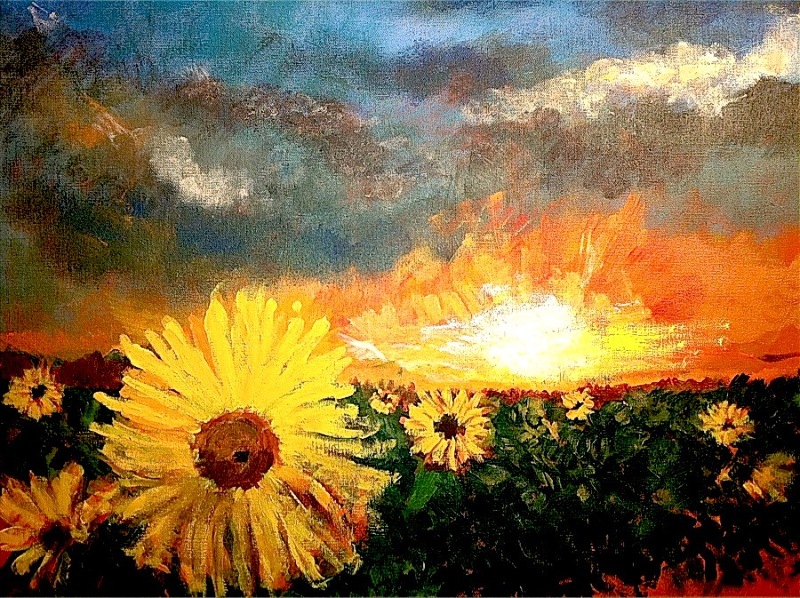 The painting is called “An Homage to Van Gogh”. Yes, my art is my first love. It has been there for me since I can remember — like an old dog that never dies! I don’t take anyone’s comment about what sells at what price or why. Some people like Timex and some people like Rolex! I have a lot invested in my art. There’s NO WAY you are paying me less than what a teenager makes at a fast food restaurant (no offense)! Just keep painting. Be happy. You’ll never lose with that smile on your face … And as you know, people are attracted to a smiling face … even Jack Nicholson’s smiling face! Thank you for identifying with the plight of the artist. I’m learning to be honest with myself and my art. I also paint what pleases me. I’m not trying to be famous anymore. Thank you for all the comments you give. I have to speak my truth today no matter what. As well as the rest of us – well said.